It’s back and with a twist tonight! Of course I’m talking about Dancing with the Stars All-Stars 2012 Season 15 which will feature 13 former contestants taking another shot as contenders for the mirror ball trophy. On tonight’s premiere episode all 13 all-star couples will hit the stage performing either the Cha Cha or the Foxtrot to impress the judges and viewers at home, hoping they’re not the first couple sent home. Let’s take a look at who will gracing the stage this time around! Season 12’s first-runner up, Kirstie Alley seems absolutely over the moon to be returning. At age 61 she is the oldest competitor this season and she’s also going to be repaired with Maksim Chmerkovskiy. The duo shared a fiery partnership the first time around so I’m guessing there will be a lot of sparks (and fights) between them again! I’ve never quite understood the appeal of Pam Anderson but I’ve come to accept that I must be in the minority. She’s back again and while her technique wasn’t fabulous last time around, her ability to become different characters within each dance was pretty impressive. She’ll be paired with Tristan McManus. I loved Sabrina Bryan and couldn’t believe how quickly she was cut (like most everyone else I think). She was proof that you can’t assume others are voting because if you just assume your fav is a shoe-in, then they aren’t getting the votes to stick around. I can’t wait to see what a more grown up Sabrina will bring to the stage alongside Louis Van Amstel. I’m surprised they’re allowing this but apparently former champions CAN come back and try to win it again. So that’s precisely what Helio Castroneves intends to do. He’s got Chelsie Hightower to help him so this should really be a couple to watch! We all loved Joey Fatone in season four and he did great finishing as the runner up. He and his charm are back dancing with Kym Johnson again. She says this time she’ll really crack that whip, kind of implying she didn’t during the last go round! Season 8 champion, Shawn Johnson is also looking for another win. She is lucky enough to be in the arms of Derek Hough so I’m guessing this is another great couple to watch almost immediately. Joey Fatone isn’t the only former boy-bander looking for that mirror ball. Also back is Drew Lachey who won season two and looked pretty damn good while doing it. Anna Trebunskaya is his boss lady this season and she’s tough so I’m sure he’ll look even better now. Gilles Marini was a season 8 runner up that single handedly made the ratings soar. He shook and shimmied and waltzed into many little old ladies hearts and so there will be a collective gasp when he takes the stage tonight. He’s paired with the fire cracker named Peta Murgatroyd, so look out! Kelly Monaco won the first season and then lost when John O-Hurley demanded a recount and then dance off. She’s a pretty determined little spitfire and is paired with Val Chmerkovskiy, who isn’t as temperamental as his brother but sure has his skills. I’m sure you’ve heard that since her reality show crashed and burned, Bristol Palin needs to continue her 15 minutes of fame and so she’s back again. Unfortunately Mark Ballas (who I happen to love) is stuck with her. Melissa Rycroft is another one that found fame on reality television, but at least she’s adorable and very likable. She’ll be Cha Cha-ing with Tony Dovolani. Season 3 champion, Emmitt Smith is considered a serious contender this season and he once again has Cheryl Burke to help him push the envelope. He’s packing that athlete focus and Cheryl has won on more than one occasion here proving that she can coach a novice to victory. Tonight’s premiere is going to have all the usual glitz and glam in the ballroom, which you won’t want to miss. 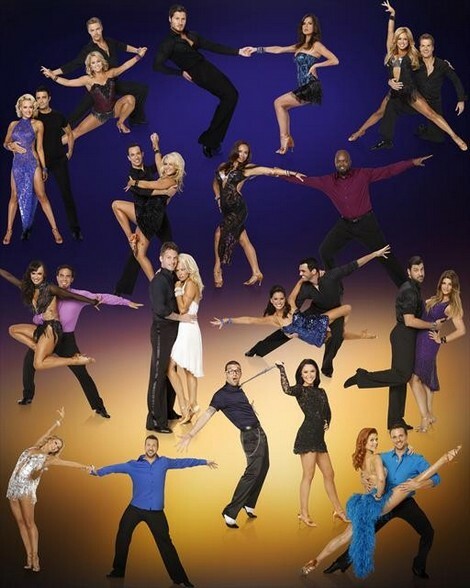 So be sure to tune in for our live coverage of ABC’s Dancing With The Stars All-Stars – tonight at 8PM EST! While you wait for our recap, hit the comments and let us know how excited you are about the new season of Dancing With The Stars All-Stars. Tonight’s recap: The level of dancing this season is supposed to reach new heights this season. Len says he expects fantastic performances this season.